The 2014 U.S. Junior Closed has come to an end and Grandmaster Kayden Troff is the winner. With only one loss in his +5 score, Troff automatically qualifies for the 2015 U.S. Championship. In the press conference, he mentioned that this tournament was stronger than previous editions and that there was a fighting spirit present. While many will look at the cross chart it may appear to be a convincing victory, but it was not so easy… especially in the beginning. Troff got help from Josh Colas who beat Michael Bodek. In Troff-Larson, the St. Louis native was playing with a lot of confidence, but perhaps got carried away against the Grandmaster from Utah. Larson’s opening was a risky one as he ceded the two bishops and had a questionable pawn structure. 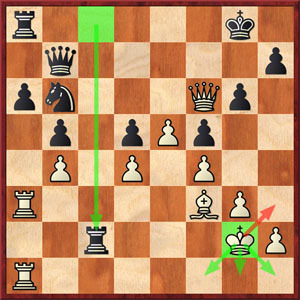 The move that came into question by the commentators was 16…Qd6?! Larson was trying to create threats on the king, but this simply lost two pawns for nothing. After 17. Bxc6+ Kf8 18. Bxb7 Qh2+ 19. Kf1 there was no follow up. Ultimately, black got the queen on h2 trapped. Troff had already won which meant there was no way for Michael Bodek to catch him. However, this game between two familiar opponents was bitter-sweet for Josh Colas who had lost four in a row. Bodek-Colas was an intense game out of a Guioco Piano. Colas admitted that he had not prepared deeply. Thus, white got a comfortable position with a lot more space. However, Colas felt that his knight would be better than the bishop. In Bodek-Colas, white has several choices. Fortunately for Colas, he chose 35.Kh3? The move doesn’t instantly lose, but all but gave up the advantage and resulted in an embarrassing loss. White poised for a queenside break-though doubled rooks along the a-file setting up deadly invasion. On 29. axb5 cxb5 (29…axb5?? loses to 30.Rxa8 Rxa8 31.Rxa8 Nxa8 32.Qd6! with Qf6+ looming) 30. Qd6. White repeated moves and played 34.Bf3 after which black gave a spite check with 34…Rc2+ (what else). White has four moves… 35.Kh3, 35.Kf1, 35.Kg1 and 35.Kh1. Bodek played 35.Kh3 which looks the safest, but there was danger lurking after 35…Rf8. In fact, Houdini says the position is now equal after 36.Qg5. Colas ended on a happy note after losing four in a row. Luke Harmon-Vellotti and Jeffery Xiong are the two player closest in strength, a mere two points separating the IMs. This game was also very equal and neither player took any risks in the Grunfeld and they shook hands after three-fold repetition on move 22. Sevian-Ostrovskiy was an interesting theoretical battle out of the King’s Indian Attack (French). Black gave up two pieces for a rook to destroy white’s pawn center, but got nothing for it. In fact, after black sacrificed an exchange, his central pawns were easily blockaded and white was poised to take control. Lastly, Justus Williams had come off of a tough loss and was looking to score against a struggling Arthur Shen. In this game were was nothing after a middlegame skirmish. The game appeared to be headed for a draw after 22…Rac8 since 23.Rb1 would hold the balance. Williams was still “playing for tricks” as Ben Finegold called it, but there was nothing to do but grab the draw. Black seized on the chance after 30…Bxg3! 31. Bg2 Bxh2 32. Qh4 Be5 33. c6 Rxa2 and in a matter of moves, black is three pawns up. After a few more moves, Williams gave up the ghost and resigned. In the press conference, a somewhat dejected Williams admitted that he had lost two of his games by pressing too hard. Justus will certainly be back! Your coverage of the U.S. Junior has been magnificent! hmmm…Every player lost USCF ratings points except for Kayden Troff, Michael Bodek, Justus Williams, and most of all Matt Larsen who gained 33. Interesting! There is now a Closed U.S. Girls Championship, to go along with the longstanding U.S. Junior Closed. This is the first I’ve heard of it–these organizers could stand to do a bit of a better job with publicity, and getting the word out. There are obviously some strong players in the field. At any rate, it’s a positive development; I hope that this event is held on a yearly basis. I hope that there is robust live coverage of the event, and transmission of the games as they are played. Opening Ceremony (free & open to the public) – Thursday, 17 July 2014 at 8AM. Room 323. Special “Basics of Chess” class taught by Vince Bradley & Eugene Tappen from 1-3pm in the auditorium at UNH Manchester on Friday, 18 July 2014. Open to the public. Thanks to UNH-Manchester for their support! The winner will receive a $2500 a year scholarship award from the University of New Hampshire. The award will be renewable for up to four years for the student who matriculates at the University of New Hampshire at either Durham or Manchester campus. Drawing of lots will be at 8:00 AM Thursday, July 17th as a part of the opening ceremonies. Thanks. I agree to an extent, but I wonder if it will encourage girls in the long run. I see this repeated at top levels where women are play primarily in women’s tournaments and their growth is stunted. With gender-based tournaments, it will keep males at an advantage since they are playing the toughest competition from a deeper pool of players. As far as scholastic, are there enough players to maintain so many redundant tournaments for boys and girls (Cadet, Open, Closed)? Not to mention you have the Polgar, Kasparov, Denker and K-12 events. Although it’s good to see players like Megan Lee still playing… and doing well! Here’s the field for the Girls’ Junior Closed, along with their ratings and respective titles. It looks like Rochelle Ballantyne has with withdrawn, to be replaced by Alexandra Wiener (2021). 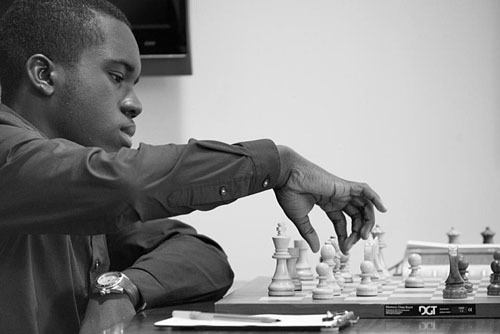 Unclear as to why Rochelle opted out–it’d have been interesting to follow her in one of her last scholastic chess events, given that she was one of the stars of the documentary “Brooklyn Castle”…. Yu (Age 12–2172) is the second seed, just behind Maggie Fend (2173). Yip (Age 10–2157), is 3rd seed, while Gorti (age 11? –2132) is the 4th Seed. So, there is already a sudden infusion of a lot of talent. an event like this could just as easily encourage the development of that talent, as it could serve to retard it. “Players include Maggie Feng, Apurva Virkud, Jennifer Yu, Akshita Gorti (ranked third highest girl under 12 worldwide), Becca Lampman, Claudia Munoz, Rochelle Ballatyne (appeared in 2012 documentary, Brooklyn Castle – highest ranked African American woman in the US), Carissa Yip (special wild?card invitation as highest ranked girl in New England), Alice Dong, and Kimberly Ding. Not only the tournaments that you mention, but there is also the U.S. National Junior Chess Congress, and the U.S. Grade Nationals. 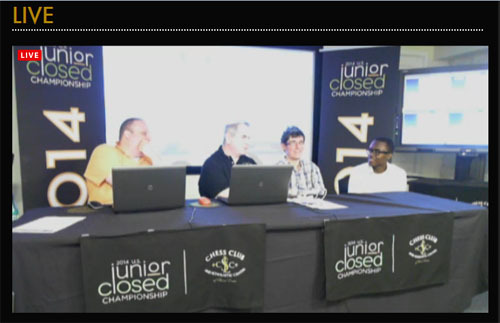 The 2014 North American Youth Chess Championship in Tarrytown, New York just took place in June. At the end of July, the following event will take place in Canada. So, yeah, there can definitely said to be some redundancy with respect to these Scholastic Chess Championships. The impetus for this is that FIDE apparently just gives out IM Titles and norms (and other lesser Titles), right on the spot. That is, somebody can earn the title in one fell swoop, by playing in a 9 Round Swiss System event ( playing only against other Scholastic players). So much for having to earn Norms in 3 different tournaments, 2 of which had to be Round Robins. However, some of these events are not robustly attended, and some of the section will have only a couple of Dozen players, with many of the top players in a given age cohort declining to participate. Thus, the degree of accomplishment entailed in a victory can vary tremendously. Any Junior player with the material resources ought to be able to “harvest” their requisite norms by playing in enough of these events. With respect to your comments about Women/Girls only Chess events, I do see your point. However, in general Girls (in the U.S., at least) are so far behind their male counterparts when they get to be in their mid-teen years that it is really too far a disparity to be overcome by pulling oneself up by bootstraps. You mention that there is a deeper pool of Male players. That is true, and the disparity gets wider and wider from age 10 or so, as Girls drop out from competitive scholastic chess at a significantly higher rate. This occurs before there really are a lot of Girls only chess competitions. In terms of Scholastic Chess Championships at a National level, there really is only the All-Girls Ch. and now this. If there were not special gender segregated Titles set aside for Girls/Women, then there rarely would be the possibility to excel (as a Champion). One notable exception might be Carissa Yip, who is just 10 years old–the youngest player in the Girl’s Closed. Yip has the highest USCF rating in the Age 10 cohort, at 2157. Jennifer Yu is 12 years old and Akshita Gorti is just 11 years old. Players like Krush and Hou Yi-Fan bounce between Women only events, and competing with men in Open events. It’s truly hard to assess what impact that has had (and whether the impact has been negative) on their respective Chess development. Judit Polgar had great success in her career, AND she eschewed Women only events. There is a correlation there, but how much of it is causal? I doubt that Hou Yi-Fan’s rating would be much different, or her playing strength much higher, if she had opted not to grasp the low-hanging fruit that comes from winning Women’s events. “Confederation of Chess for Americas (CCA), the Chess Federation of Canada and organizers of the 2014 Kitchener Chess Festival are pleased to invite the National Chess Federations of USA, Mexico, Bermuda and Canada to the first Annual North American U20 Chess Championships. The tournament will be held from July 30th to August 4th, 2014, in Kitchener Ontario. Clear first = 9 round WGM and GM norm. Yes… and I’m dead set against “instant titles”. They cause an incongruence in the title system where you can have both a 1700-rated FM and a 2350-rated FM. Same with the IM titles. I have seen players get IM titles in a weak subzonal without playing an IM. It is like a diploma mill. Those titles are technically the same, but the standards are different. So an 2100-2200 rated IM who gets the title in a single, weak subzonal is the same as one who gets five IM norms and 2400+ ELO. It’s ridiculous. I was told by a prominent FIDE politician that it was designed to ensure that all federations could have at least one titled player. Fortunately, almost all the requirements for the GM title involve three norms except for winning World Junior, World Senior, making last eight in World Championships. Double GM norms are given at Olympiad. However, in general Girls (in the U.S., at least) are so far behind their male counterparts when they get to be in their mid-teen years that it is really too far a disparity to be overcome by pulling oneself up by bootstraps. I don’t believe gender-based tournaments and titles will correct this. Judit Polgar was even further behind her male counterparts 25 years ago yet she was crushing GMs at age 13. Thus far, she is the historic model to study. The Polgar sister believe they had to prove themselves as equal professionals and largely eschewed women’s competitions. In chess, girls are being positioned to do the opposite… solving inequality by segregating themselves. It appears to be counterintuitive given the fight women are waging on inequality. I don’t see why girls can’t achieve general titles by winning. There are too many examples of women who have. Girls have to be encouraged to shoot for the higher goals if they want to be seen as equals in chess. That is the general fight. The institution of women’s titles is a self-imposed glass-ceiling with valuable time and energy being wasted. We all would be appalled if someone suggested that we had to create special titles (of lower standard) for players of a certain demographic. It would be ridiculous. Just how would women feel if there were special degrees for women in engineering? math? science? How about a W.B.S. Mathematics? Sounds ridiculous and women mathematicians would be outraged. Girls will never feel they are as good as boys in chess as WFMs, WIMs and WGMs. These segregated titles give girls an inferiority complex because they know they are not equal to the counterpart titles. I just interviewed FM Alisa Melekhina and she eschews the “WIM” for the general “FM”. Irina Krush earned her GM title with three GM norms and is also against the women’s titles. They want to be treated as a peer since there are no inherent disadvantages in playing chess. Remember the phenomenon “trophy inflation”… people getting awarded for lesser achievements. When I was a junior player and got 1st place, the trophy was about 12-24 inches high. Now you can get 10th place and a trophy nearly twice that size. I don’t believe these “incentives” help in the long run. Eliminate women’s titles, but provide more incentives for girls/women to compete against the best possible competition. Maybe they should do away with titles altogether. It’s already a big mess. The U.S. Cadet Chess Championships are well underway. With 7 out of 9 rounds finished, Edward Song (2378) has a robust full point lead, with a score of 5.5/7 (+4=3). Christopher Gu (2417) has a very solid score of +2=5, and is tho only other player not to suffer a loss. Kapil Chandran (2359) has only played 1 Draw: He’s +4-2=1. Cameron Wheeler is also at a net +2 (+3-1-3). The Wild Card invitee, Andrew Zheng (2181) has played some interesting Chess, bu unfortunately has been outclassed (=1-6). He and Joshua Colas (2430) are more or less “paying the field”. Colas’ play has been uncharacteristically passive, and after a decent start (1.5/3), he has lost his last 4 games, including a marathon game of about 150 moves. Colas may finish the Cadet with fewer points than he earned against a tougher field in the U.S. Junior Closed (He finished with 3.0/9 in the Junior). It’s a pity, as this may be his last chance to compete in the Cadet, due to aging out. The thing about scholastic chess is that many are on the rise some these 2350+ players are probably the same as the 2400 players. Yes, ELO is a very good predictor, when it comes to Andrew Zheng, who is conceding a disadvantage of over 200 rating points in most of his games. His lack of experience of events at this level is telling, too. Let’s hope that he sloughs off the result. I do agree that Seeds 1-9 are more or less at the same skill level, The 2400s in most cases have had better recent runs of good form, and accrued more rating point gains. However, local conditions prevail: How well do the Cadet players adapt to playing 2 grueling games each day, against fellow scholastic players. And based on the fact that Scholastic players are on an upward curve, none of them can be said to be Overrated….although some of them are less underrated than others. Some variation can be attributed to eddies in the regional rating pool. At 2378, Edward Song is only the 7th Seed by rating. 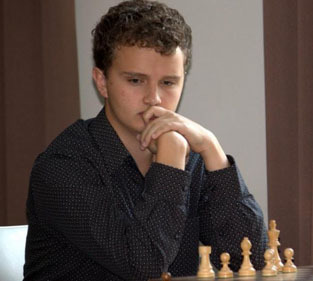 However, based on his play heretofore, it is clear that he will be a force in Scholastic Chess circles, and may even make an early “graduation” by earning the GM title in the next few years–before he ages out of Junior Chess competitions. If he wins, I believe that Song gets Invited to the 2015 U.S. Junior Closed. Poor showing for Josh. He’s in a slide and lacks confidence in his openings, so he is trying to play 1.Nf3 systems. Tough to lose four. Typically when you have that kind of streak, you want to draw to break the streak. We’ll see what he does. Edward Song DID win, albeit by a roundabout way. Song lost to Andrew Tang in Round #8, after playing the opening quite provocatively as Black. As Kapil Chandran managed to grind out a long victory against Checa (who now stands at -1), in one fell swoop Song and Chandran were tied for 1st Place at +1. That set up a perfect culminating pairing to decide the Title: Song vs. Chandran in the Final Round (#9). Song broke through in a Classic Sicilian attack, and so wins the title at +4. (+5=3-1). Chandran drops to +2 (+5=1-3)…..Chandran’s 5 wins impress, although not all of his speculative play panned out. In any case, if there was an award for Fighting Chess, he would have earned it. Christopher Gu defeated the outmatched Andrew Zheng, and so finishes in 2nd Place with +3 (+3=6-0). Gu was the only player to make it through the 9 Rounds of the tournament without defeat. Normally, a +3 score would suffice for at least a share of 1st Place, but the Top players scored heavily. Zheng finishes in 10th Place with just 0.5/9. Ruifeng Li beat Colas, so Li ends up with a creditable +2. Colas’ passive defense strategy couldn’t quite hold; Li pulled off a few minor tactics. Colas finishes at -5. (+4-=4-1). Nicolas de T. Checa lost another long game, to finish at -2 (+2=3-4). I considered him one of the tournament favorites, based on his victory at the New York State Championship last Labor day, as an 11 Year old. Top Seed (2436) Mika Brattain had a rough start, beginning with 2 losses, and sitting at -2 after 5 Rounds. He has clawed his way back to +1 (5.0/9–(+4=2-3). His was the last game to conclude. He just ground down Andrew Tang, who took his chances in a forlorn ending. Just as Brittain manage to finish +1, so Tang drops back to = (+2=5-2). In case anybody is interested, here are the Final results for the inaugural U.S. Junior Girls’ Closed Championship, which was played in an overlapping time frame with the Cadet. Definitely interested. I saw on Facebook and Twitter that Claudia had won, but didn’t know it was a tie. This is far stronger than many of the All-Girls tournaments of the past. I still believe there is too much redundancy. Yeah, and most of these girls are just young teens (Carissa Yip isn’t even yet a teen), so they are bound to improve. IF there was a Girls’ Closed Championship tournament limited those Age 15 & Under (Analogous to the Boys’ “Cadet”–although obviously a more suitable name would have to be found! :-), the players comprising the field would be much the same as it is now. So, a separate closed tournament for the girls would, as of now, be rather redundant. It is clear that there is a new generation of Girls who have parents who are fully supporting them to excel and succeed in Competitive Chess, and represents the culmination of the scholastic boom. Soon, there will be no “low hanging fruit’. Interesting that Feng was a Co-Winner at + two, and Undefeated, too!. Her score was 5.5/9 (+2=7-0). Feng might even lose a few rating points from the event. It’s just surprising that Experts would obtain so many Draws, whilst presumably striving hard for the victory. Thanks! I’m going to do reports, but I will also mention the issue about so many of these tournaments. It is not necessarily a bad thing, but there is quite a bit of overlap. Your notes help. So difficult to cover all of these tournaments. I’m gearing up for the Olympiad in Norway. That is the most difficult. This was his worse tournament result ever. He did call me after he lost to Checa and he was upset about that loss. Next round he blundered his knight to Song, he became even more upset. Then he lost the marathon game against Mika and he lost confidence and never really recovered. I guess this is something that happens to every player one time or another in their chess career. Funny, but when he was younger, a loss never bothered him. He’ll recover and come back! Guy, I am sure that Josh will learn from his mistakes!